- "Infinite slope " - a platform which has an inclined surface with moving on it looped ribbon made ​​of a special material that mimics the top layer skalzhenie skiing and snowboarding on real snow . The tape facing up an incline towards the skier . RC instructor sets up the various skiing conditions . For safety in the simulator provides a soft start and soft stop tape , sensors emergency stop. 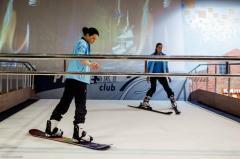 Sports simulator PROLESKI uses ordinary equipment : skis , boots, poles , snowboard. At a certain distance ahead of the simulator PROLESKI, the mirror can be installed over the entire width of the simulator , which allows skiers to control their movements during training . Maximum belt speed of 25 km / h electronically limited , respectively, for 10 min skier passes over 4 km of motorway . Job PROLESKI software package together with CCTV and access to the Internet , allows you to fully control the operation of equipment and personnel. By orders of magnitude faster and more effective achievement of results , thanks to the direct determination of the coach near and feedback using a mirror . High level of security , you can focus solely on the lesson. Continuous employment accelerates the achievement of results . By coating , skiing conditions are more demanding load above. Effective testing of individual machine components near the start bar. Save time - no ski lifts and slopes endings . Convenient and effective learning in groups. Low cost of education and training . Fast and high-quality training before the trip to the resort . Fitness , work in "problem areas" . Unbelievable price on Ski simulator PROLESKI indoors - infinite slope , ski machine in Dnipro (Ukraine) company Ski simulators PROLESKI indoor for skiers and snowboarders | Production, sale, installation turnkey | infinite slope and endless slope.